Many thanks to Luisma (he is 2bajopar follower) who sent in this observation of “corporate culture” (sorry por el inglés pero traducido no es lo mismo). 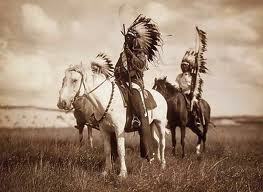 The tribal wisdom of the Dakota Indians, passed on from generation to generation, says that, “When you discover that you are riding a dead horse, the best strategy is to dismount”. 1.- Buying a stronger whip. 3.- Appointing a committee to study the horse. 4.- Arranging to visit other countries to see how other cultures ride horses. 5.- Lowering the standards so that dead horses can be included. 6.- Reclassifying the dead horse as living-impaired. 7.- Hiring outside contractors to ride the dead horse. 8.- Harnessing several dead horses together to increase speed. 9.- Providing additional funding and / or training to increase dead horse’s performance. 10.- Doing a productivity study to see if lighter riders would improve the dead horse’s performance. 11.- Declaring that as the dead horse does not have to be fed, it is less costly, carries lower overhead and therefore contributes substantially more to the bottom line of the economy than do some other horses. 12.- Rewriting the expected performance requirements for all horses. 13.- Promoting the dead horse to a supervisory position. De ahí, la importancia de los símbolos.